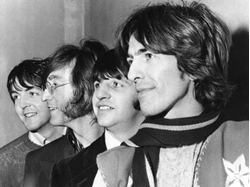 The Beatles, if you haven't noticed, are still a big deal . Beatles Radio: The Beatles, Solos, Covers, Birthdays, News The Fab 4 and More! Just like that, I had my Beatles reference for the day and the conclusion to a 50-day experiment in scouting Fab Four allusions in my life. Thursday marked the 50th anniversary of the release of the Beatles’ self-titled double album, a sprawling and unpredictable collection of songs that arrived in stores exactly five years after the assassination of President John F. Kennedy. John Lennon, Paul McCartney, George Harrison and Ringo Starr burst into U.S. consciousness, of course, in early 1964 to offer a measure of joy to a nation mourning the death of JFK. “A Hard Day’s Night" on the big screen, the Shea Stadium concert, “Yesterday” single, “Sgt. Pepper’s Lonely Hearts Club Band” album, retreat in India, animated “Yellow Submarine” movie, rooftop performance and many more moments added up to an unrivaled pop-culture presence in the 1960s.